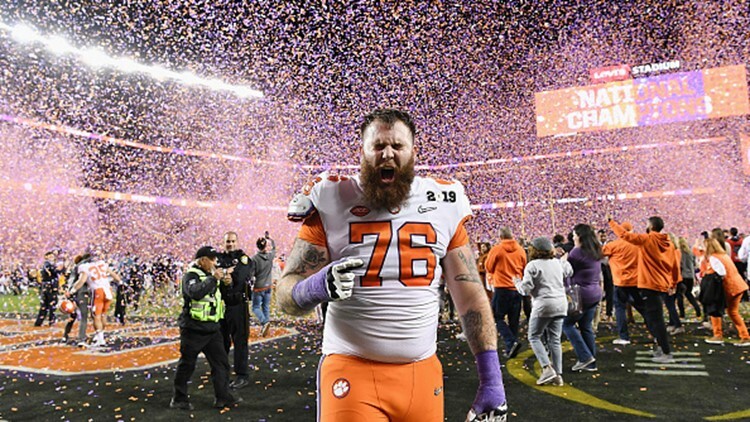 Sean Pollard #76 of the Clemson Tigers celebrate his teams 44-16 win over the Alabama Crimson Tidein the CFP National Championship presented by AT&amp;T at Levi's Stadium on January 7, 2019 in Santa Clara, California. In the fourth consecutive playoff meeting between the Tigers and Tide, Clemson evened the series and beat 'Bama for the national title for the second time in three seasons. Clemson is the first team in the AP poll era, dating back to 1936, to finish 15-0.